How long have you worked at ON-Broadcast? 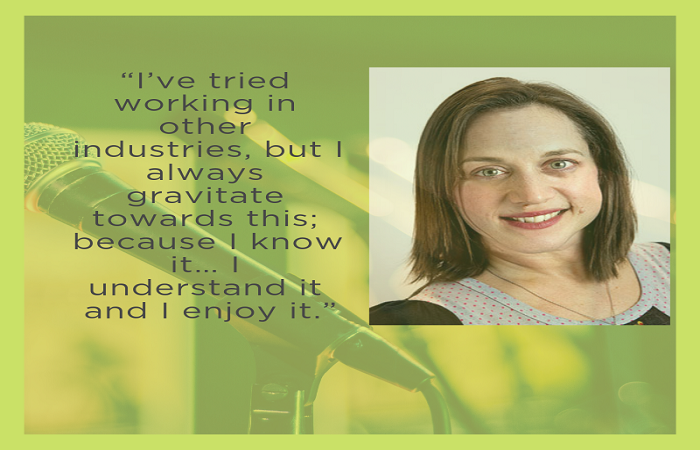 I’ve been at ON-Broadcast for many years… freelancing when I was on maternity leave, running studio sessions, keeping my fingers in and then I came back full-time two years ago. What is your role at ON-Broadcast? It’s hard to define my role because it’s so varied, but I’m the media team manager, I’m managing a team of four complete lunatics, which is brilliant! If you could write your own job title that best describes what you do here, what would it be? Motor-mouth, because I like to get on the phones and talk to stations. Securing some major national coverage – I get such a freaking buzz from it and it doesn’t die down the longer I’ve been here. It’s still as exciting as the first time! What is your background, and why did you decide to take this career path? My background is in tv, that’s where I started and I’ve always been passionate about broadcast… genuinely – I’m not just saying that because I work in it. There isn’t much that floats my boat and it’s always been like this – it never changes. I’ve tried working in government, I’ve tried working in other industries, but I always gravitate towards this because I know it I love it I understand it and I enjoy it. What’s been your favourite project you’ve worked on at ON-Broadcast? Boney M, when they came in! I’m a massive fan of them. Rather wish I hadn’t gone up to her [Liz Mitchell] and sang Rivers of Babylon, but she found that really funny. What did you want to grow up to be when you were a child? If you could swap places with anyone in the world for the day, who would it be and why? Meghan [Markle]… obviously! Just to be in her shoes for a day, I think she’s living an absolute fairy-tale, gilded life. I wish her so much of the best, I would kill for the chance to be her. What are you watching/reading/listening to right now? American Gods on Prime. Becoming Michelle Obama. I’m listening to Scala Radio, the new station set up by Simon Mayo, for a bit of classical love… which is having a wonderous effect on my emotional wellbeing. I’m a Pilates fan and don’t really get an awful a lot of time because I’ve got two girls, a five and an eight year old – I absolutely adore spending time with them… most of the time. How do you digest your news? In this day and age, now that we’re high-tech and highbrow…. I simply say: “okay google, what are today’s headlines?” And I get the headlines from the BBC Breakfast bulletin, Sky News bulletin, CNBC bulletin (which I’m not really interested in, so I skip that one) and Bloomberg. It’s pretty cool I get my snapshot of my news and I get to hear whether one of my stories made it on there as well which is quite cool. Website you visit most frequently? Kissing the office dog on the lips. It used to be I Will Survive but I can’t reach those high notes anymore, and it really was, I was the karaoke queen at university. So now it’s Believer by Imagine Dragons or Neon Blue by Steps. Would you rather fight 500 duck sized-horses or one horse-sized duck? 500 duck sized-horses – I’d kick them out the way. Tell us something we don’t know, or would be surprised to know? I’m naturally curly, corkscrew ringlets!